All of my life, few things have made me happier than being outdoors as much as possible and there was nothing I ever wanted more than to travel to Canada’s North. 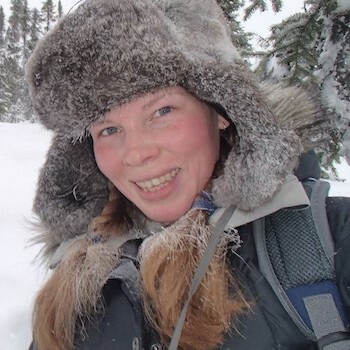 Thus, when Associate Professor Jennifer Baltzer posted an opportunity to study forest ecology in the Northwest Territories, I was sold on the project. My enthusiasm for it must have been apparent because a few months later I was on my way to the remote Scotty Creek Research Station just south of Fort Simpson, NWT, for the entire summer. My recent paper in the Journal of Geophysical Research, “Growth Dynamics Of Black Spruce (Picea Mariana) In A Rapidly Thawing Discontinuous Permafrost Peatland,” which came out of the field research, is a study of how the combined effects of changing climate and extensive permafrost thaw have influenced growth of the most widespread (and arguably iconic) tree in Canada’s boreal forest. Contrary to what you might think, permafrost plays an important role in providing a solid foundation and dry ground for many northern forests to establish on. Using tree rings to provide long-term records of growth, repeat aerial imagery to derive permafrost thaw rates, and archival climate data, we found that there are widespread growth declines at our study site – a response that is consistent with many other boreal forests. It was particularly surprising to find that despite a huge proliferation of wetlands and a generally wetter landscape due to thawing permafrost, many trees are experiencing drought stress and consequently declining growth. We initially expected there to be three main groups of trees based off their growth dynamics: waterlogged trees at the immediate edge of forest-wetland interfaces where permafrost has degraded entirely, trees under drought-stressed conditions in the interior parts of forests due to increasing evaporation and plant transpiration demand as temperatures rise, and trees in a midway “happy place,” where increased moisture from permafrost thaw could ameliorate the effects of drought stress. Instead, we found that most trees were showing growth trends that indicated drought stress, regardless of where they grew. While there were a number of trees that showed evidence of waterlogging, drought stress (likely caused by the shallow rooting structure of black spruce) may pose the greatest challenge for the species in an environment where the thickening active layer (seasonally-thawed soil) makes the water table too deep to benefit these trees. This certainly does not fit with the broad expectation that climate warming will benefit high-latitude forests and is an important consideration in predicting the future of boreal forests. Anastasia Sniderhan works with Associate Professor Jennifer Baltzer, Canada Research Chair in Forests and Global Change, in the Forest Ecology Research Group lab.